When will they build a doggy door for the stout K-9? This was Paul’s assignment from Design News Magazine for the monthly article on “Gadget Freaks”. These three young inventors designed a dog door that will only open for your dog. You can also program the gadget to feed and water your K-9 family member. 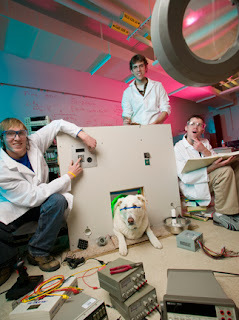 The inventors didn’t have a dog of their own for the photo shoot so we hired a real pro – our own pooch, Rico. He was well paid in dog biscuits and half of a “Big Daddy Burger” from Good Times. It was hard for him to go through the door since it was designed for miniature poodles or smaller, but if we had a dog that small, how could the dog wear protective OSHA eye gear?